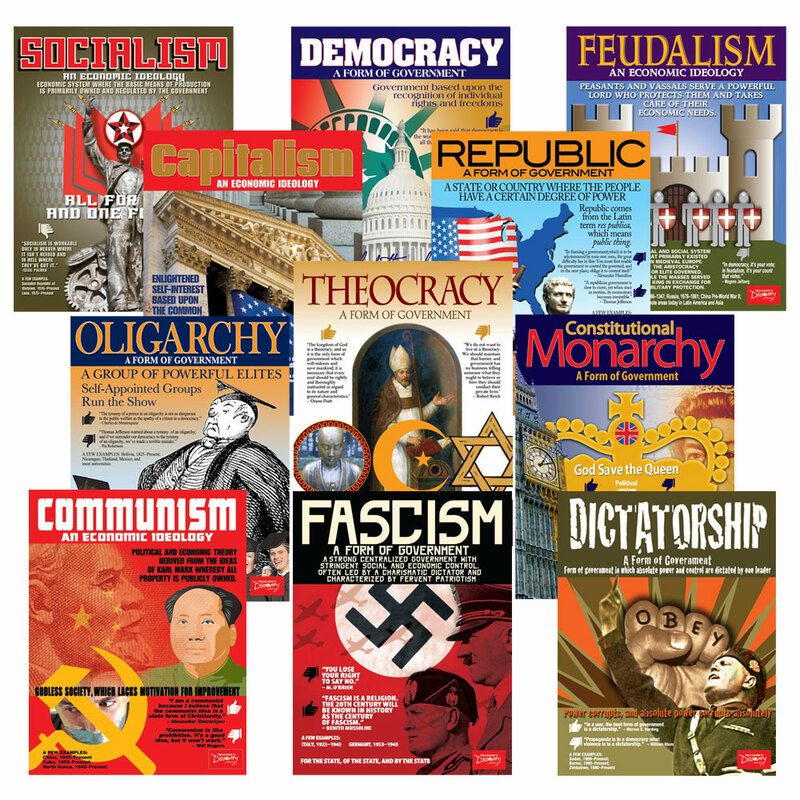 Share the differences in political ideologies in a fun, quirky way with your students! 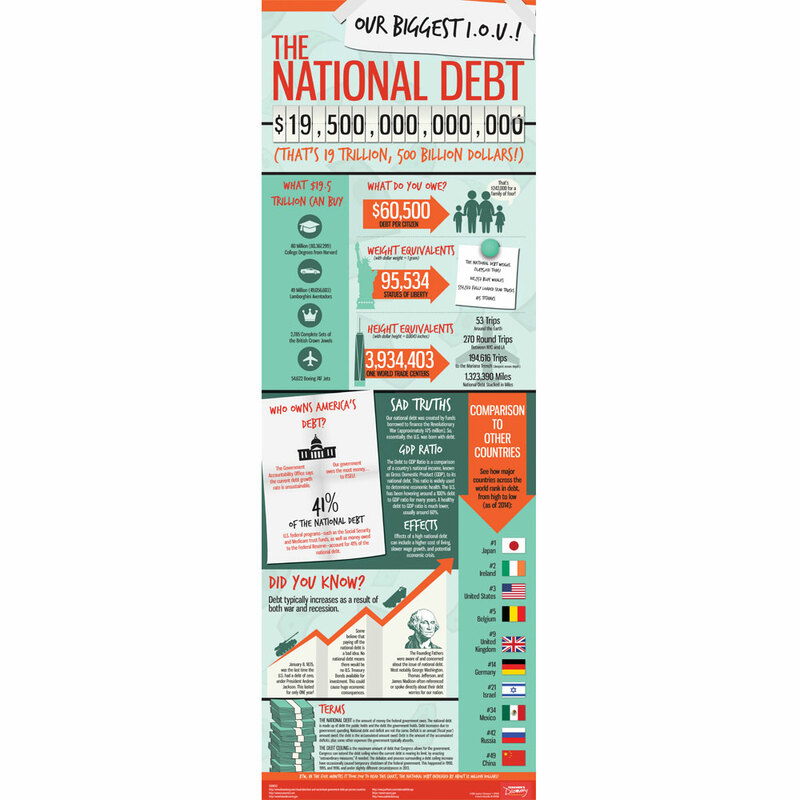 This colorful set is a fresh take on our bestselling poster, complete with 10 mini-posters (12 x 12 inches) plus a 6 x 24 inch topic banner. Great posters but text is a tad small. I love this set. It's colorful, fun, and a big improvement from the older version. I'm impressed by how big the set is when it's hanging all together on one wall. It really makes a nice statement. For humor only- quality issues. 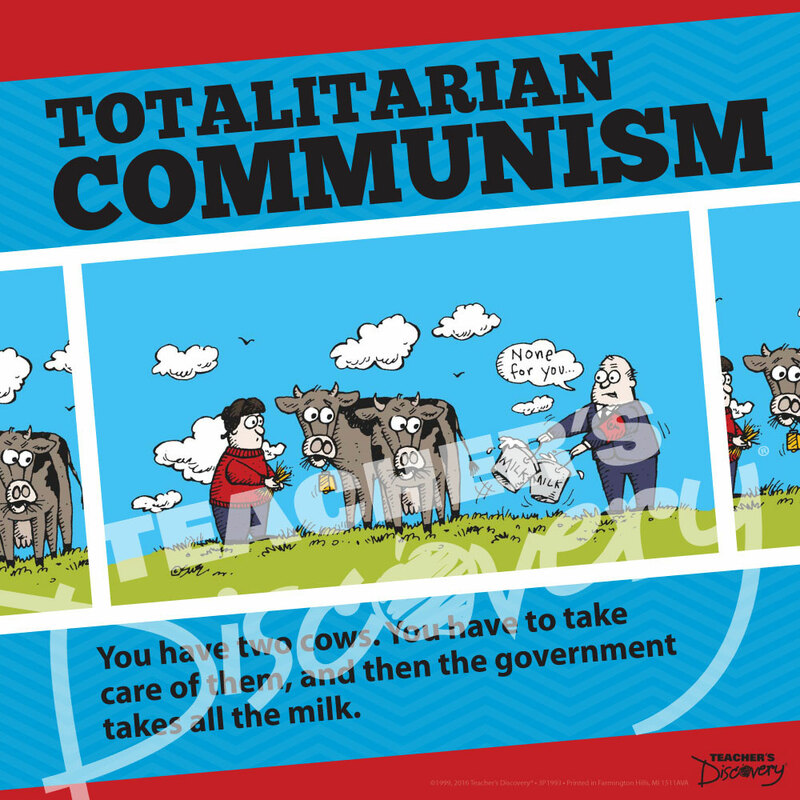 One of my coworkers had the poster version of this concept in his classroom and I always wanted it. 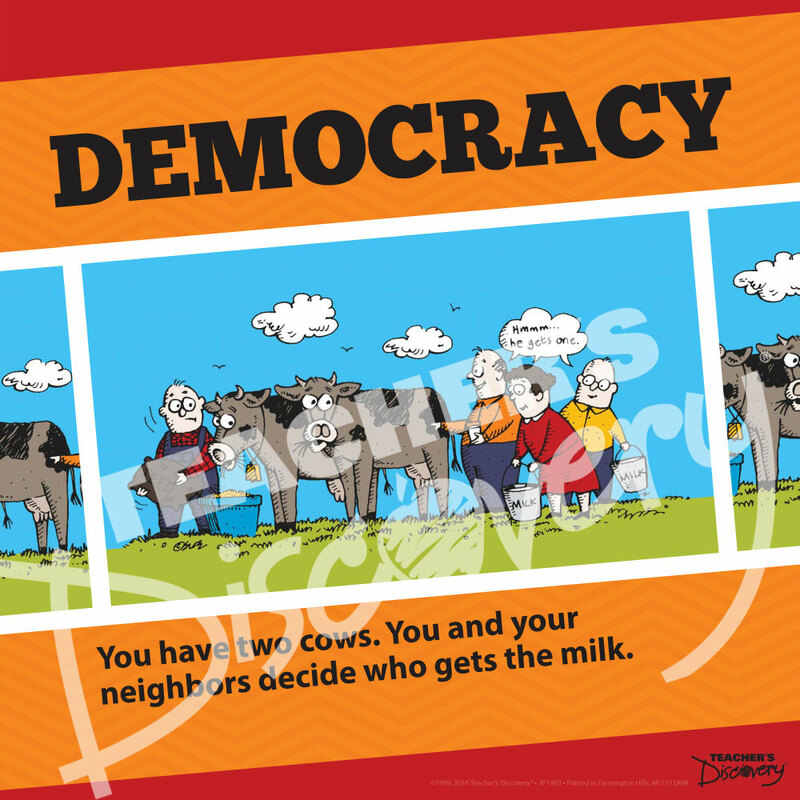 I saw that a newer version of it was available- so I bought this set with the hope that my students find it as funny as I did the first time I saw it. 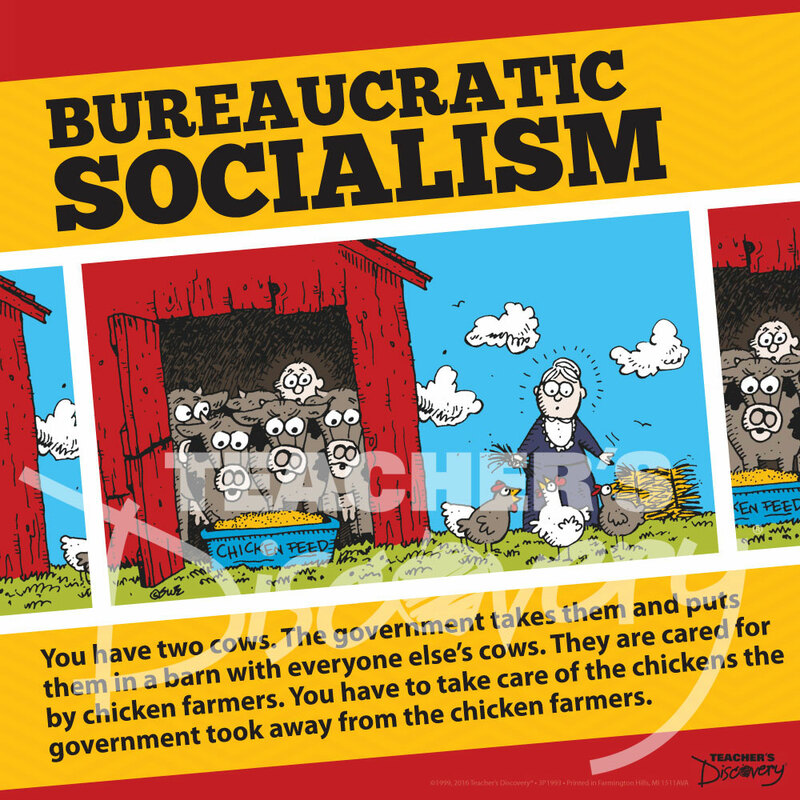 That brings me to my main concern about this set- it really is meant to be a funny interpretation of these government and economic systems. 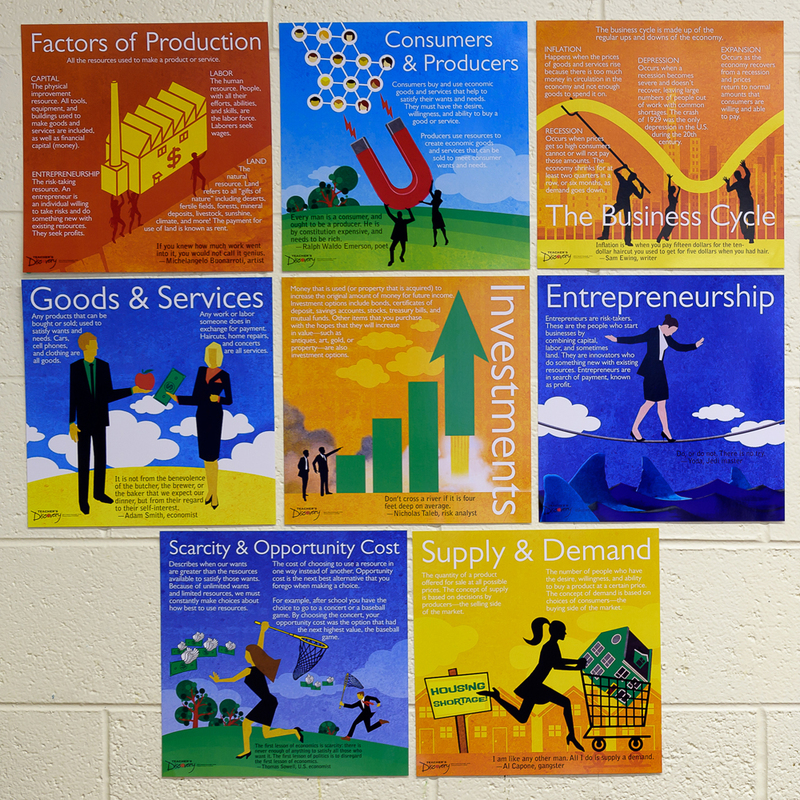 If you are going to hang these in your classroom- you really need to explain to students the actual facts behind these gov't/econ systems- otherwise they are going to think that the posters are factual- which in some cases they are not completely accurate. The set that I received also had some quality issues with the printing/cutting. The edges of several of the 12"x12" posters were not cut straight (I wouldn't have noticed except I used a paper cutter to trim after laminating them). 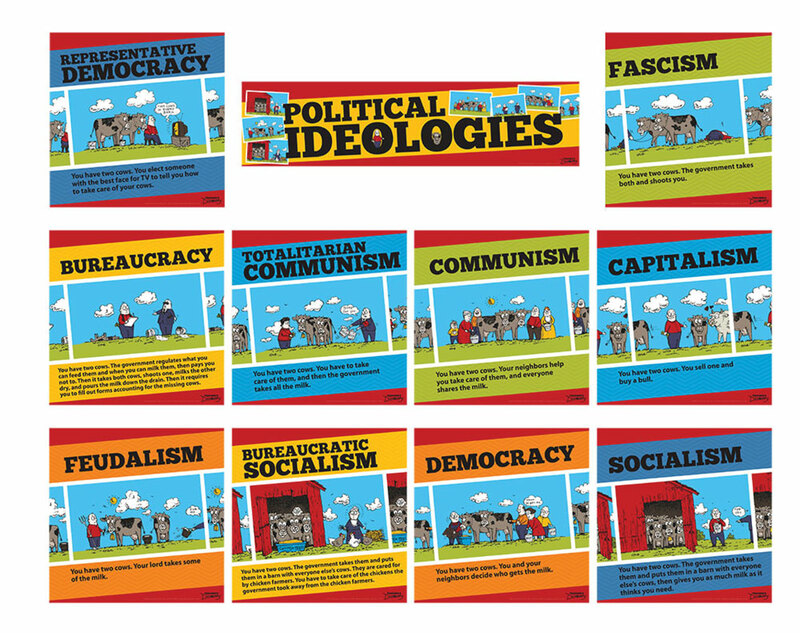 The "Political Ideologies" banner (which comes in two parts) also did not line up correctly. If you line up the letters so they fit properly, the two parts are not even- with the top/bottom edge of one side one sitting about 1/8" higher than the other.  Most people probably wouldn't notice- but I'm a stickler for those types of quality issues- especially when you consider the price of this set. 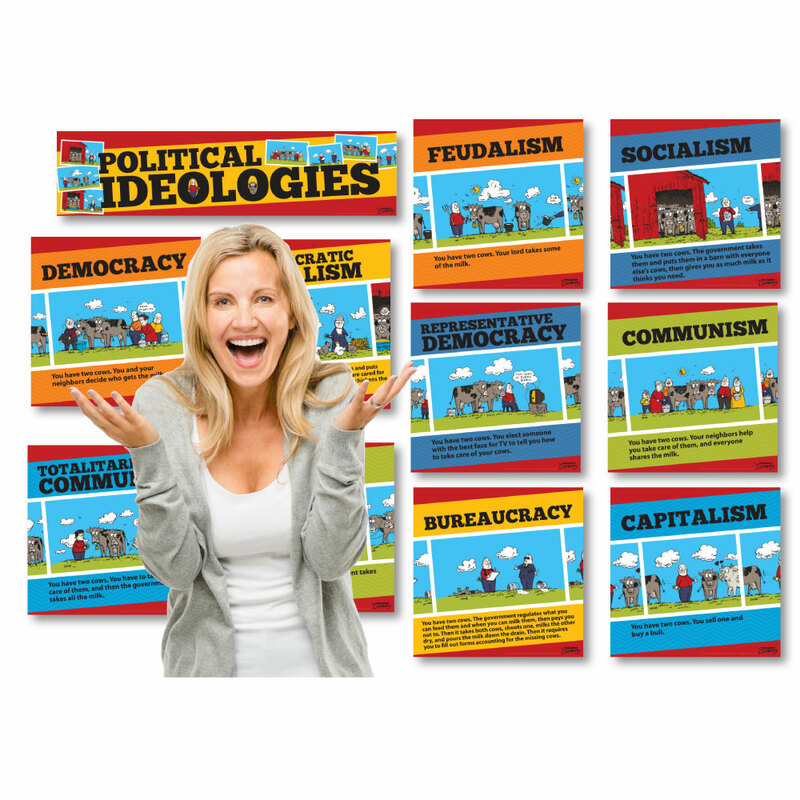 Political Ideologies poster set is TERRIFIC! 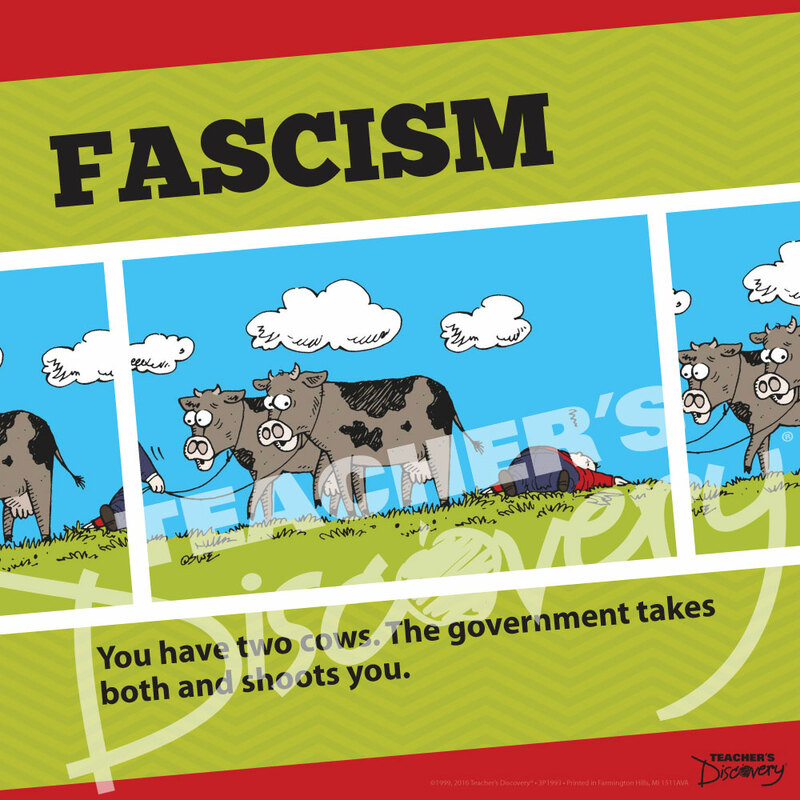 One of the other teachers at my school has had TD's "cow poster" on his wall since I first arrvied and I always thought it was funny, though a bit dated visually. I was so excited when the new catalog arrived and I saw that that poster had been revised into a great mini-poster set. 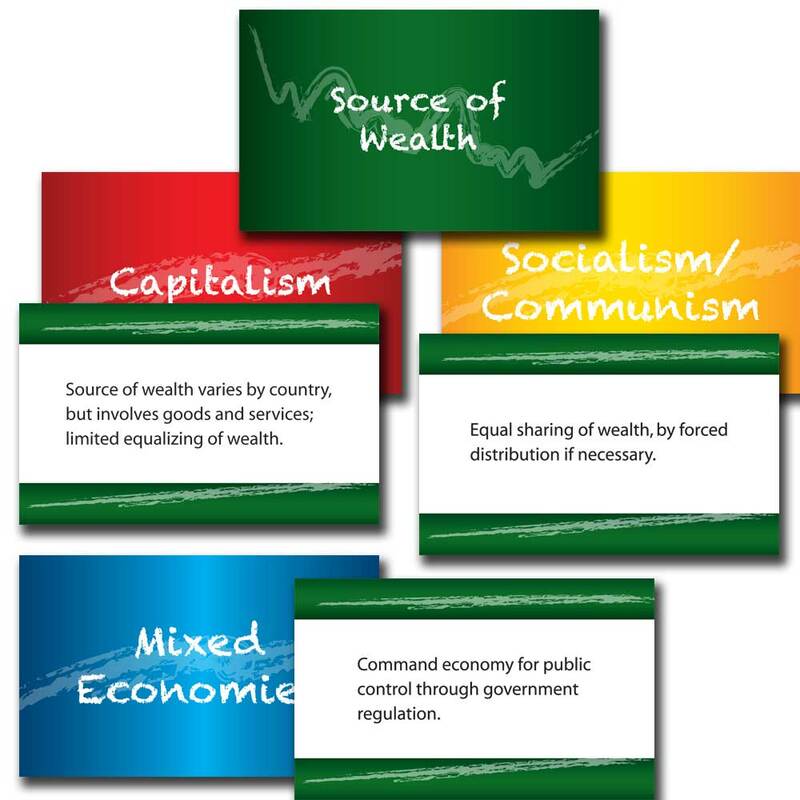 My students find this set funny, but also interestingly correct. This is a winner that should be in every American SS class.  Thanks for making it.